It hasn’t known whether it was winter, spring or summer today. Today’s delivery of a veg box, however, proclaimed that the sun must shine and brought us broad beans, a luscious lettuce and bright pink radishes among its many treats. I fully admit that when we receive radishes in a veg box they often wilt for a week in the fridge and get thrown. I don’t know why, because a radish is a lovely little thing that can add a peppery bit of zip, crunch and warmth to many a plate of food. Rather than let them go to waste this week, I decided to use them straight away in a simple salad. First, de-pod the broad beans and simmer them in a small pan for four minutes. Once drained, let them cool for a couple of minutes before slipping the bright green beans from their tougher outer skins and set aside. Next, top and tail the radishes with a sharp knife and half them lengthways before giving them a quick rinse. Next, melt a little butter in a large frying pan and add the radishes, turning them once in a while until they just start to brown at the edges. Add the broad beans and cook for one more minute. While the radishes are cooking, roughly chop some sturdy salad leaves (gem or rocket, for example, will both do fine) and dress them with a little olive oil and lemon vinaigrette. Place the leaves in the bottom of shallow bowls then add the radishes and beans. 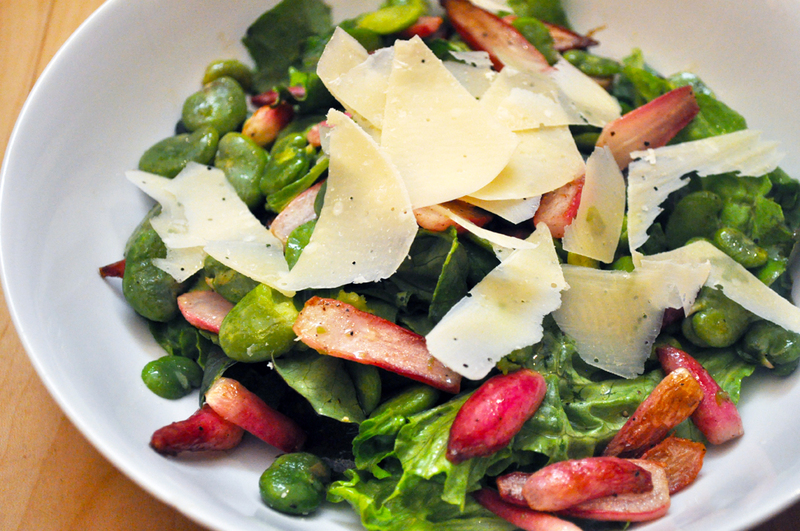 Top with shavings of a good parmesan or pecorino. It almost feels like summer.